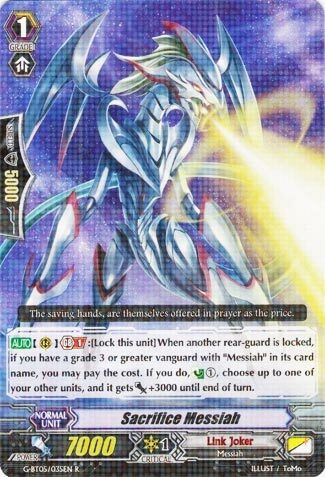 [AUTO](RC) Generation Break 1:[Lock this unit] When another rear-guard is locked, if you have a grade 3 or greater vanguard with “Messiah” in its card name, you may pay the cost. If you do, Counter Charge (1), choose up to one of your other units, and it gets [Power]+3000 until end of turn. Are you not running this in Messiahs? Why? Why would you pass up essentially free countercharging and more to unlock for multi-attacks and boosts? It’s a countercharger with a Messiah name, that locks itself for multi-attack use and gives a 3k to someone else. Use it at 4 copies like people have always done. Or Dark Chameleon if you wanna be edgy.